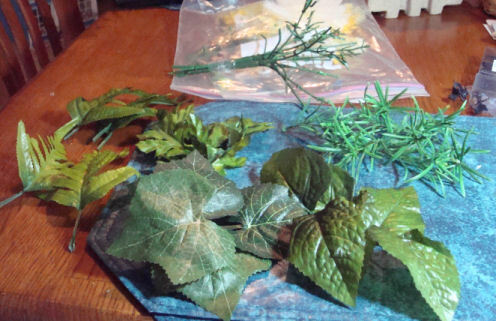 I am always on the lookout for flowers and plants that I can take apart to use in different ways. These blossoms all came from one bunch of dollar store flowers. 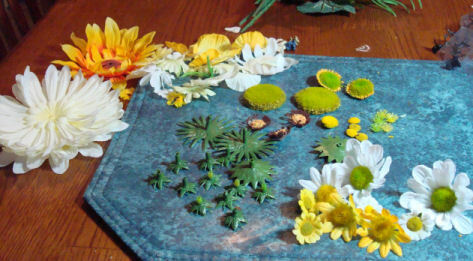 After setting aside the blooms I wanted, I took the rest apart to see what I might be able to use in future. 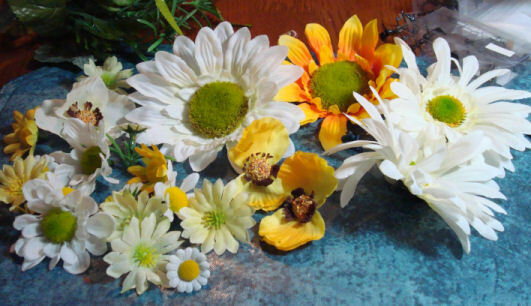 On second thought, those flower colors are so cheery; perhaps I could use those petals to dress a doll. These centers are little mounds of grass! The little yellow pompom-y semicircles could be fairy stepping stones? 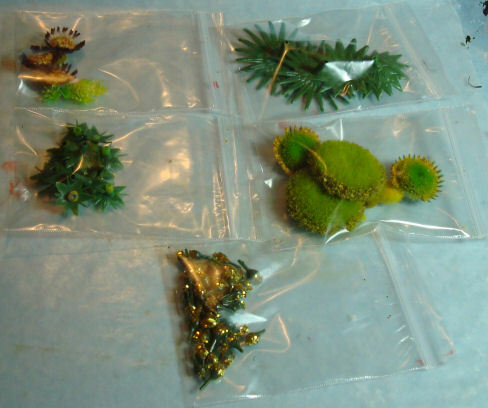 Not sure about the brown leafy things on the left, but the centers look like birdseed. 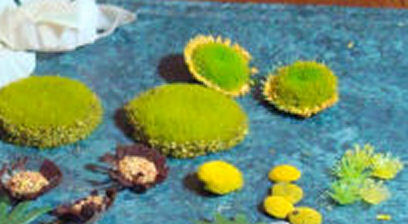 The little gold thingies were part of the centers of one flower; not sure what they could be, perhaps trims for 30s, 40s, hats? Anyway, I bagged each element separately for future possibilities. I paid a nickel for this in a clearance bin. I can see those ready-made curves around windows and doors in fantasy settings, and who knows what else? I found these budding branches at Joann's after-Easter sale. Made me think of Easter eggs. I plan to paint some of these "eggs" other pastel colors and use them perhaps as part of a climbing vine growing beside the McKinley House, which is rented out right now to Hiram Rabbit. See Dollhouse Pages: The McKinley House. 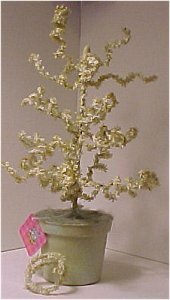 This little Easter tree could make a whole lot of little wreaths and swags! Or even a tree! 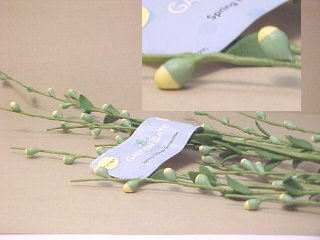 I found this stem among the spring assortment at JoAnn's. All I need do is add a few dots and trim the leaves to a more rounded shape and - strawberry cluster! Painted red, and with yellow clusters in the center, won't these little leaves be passable poinsettias? Some, of course, would be painted green, as well. 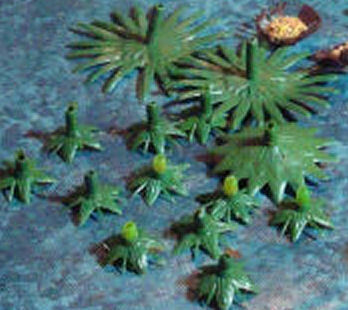 And, of course, painted green (or already green, as one stem was), they make good background greenery for a flower garden. Gosh, they also look like they could be dancing leaves in some fairy setting! 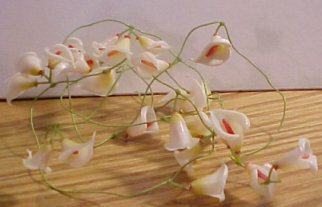 I'm not sure yet what I'll use this little garland of lily-like flowers for, and don't even remember where I got it, but it makes me think of fairies. The flowers are a bit shiny, so I might paint them; then again, I might not. 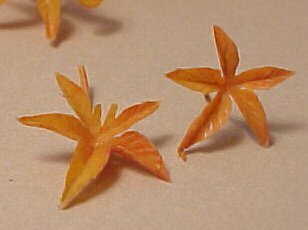 They might be combined in some fashion with the fairy lanterns made from jewelry findings and, of course, some leaves need to be added, too. 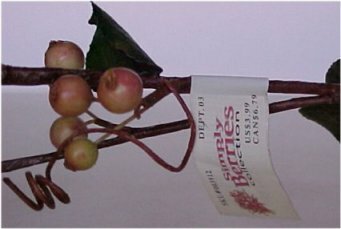 I got this stem because its berries reminded me of some full-size fat candles I had at one time. Doesn't that look like a candle? 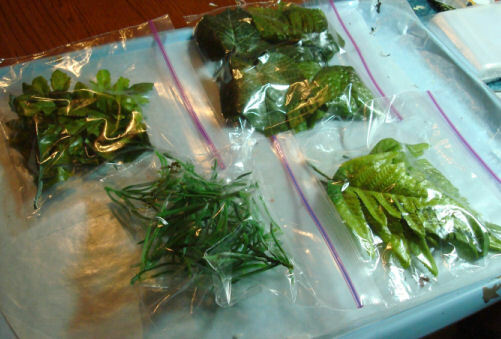 The sort you see grouped on a tray in the bathroom, perhaps, or on a coffee table? Matter of fact, my grandchildren did use the darker ones as candles in their wizard's boxes. I still have the rest of them to use somewhere. 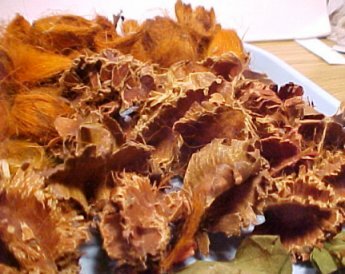 No doubt the leaves can be used in some fashion, too, perhaps with a little repainting and judicious cutting they might serve as staghorn ferns? Just attach them to a little clump of moss attached to a small piece of bark, maybe? 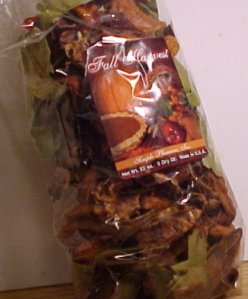 This bag of fall themed potpourri was at Tuesday Morning. Besides the appeal of its lush cinnamon spicey odor, it was filled with some very unusual elements. 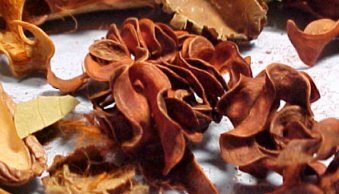 It took a while to sort everything out, but its contents revealed some of the most intriguing bits I had ever seen in a bag of potpourri. These curly pods look like they belong in a fairy setting. These pods form curls and circles; perhaps they could be collars on elves, or sprites' playground slides or ..... Strange, huh? 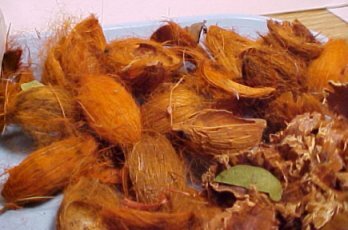 The orange fur on these pods could be hair; matter of fact, I used a teeny tiny bit on one or two of my fairy treetop babies. The interiors make nice cushy little beds for some kind of wee creature, too. I suppose these seed heads could form some kind of tree or bush in the appropriate setting; maybe a Halloween or fall-type scene. 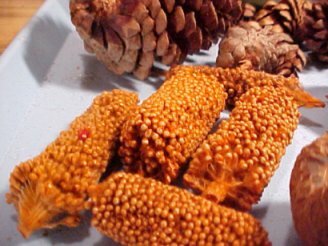 There were even a few "regular" pine cones in the bag, as well. Because they are so heavily scented, they can be used in a shallow wooden bowl on my full-size coffee table this winter. 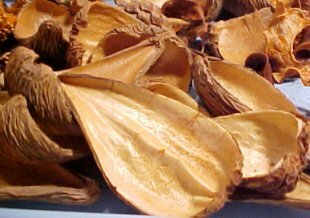 These pods would make boats, sleds, beds, fairy throne/chair backs....? Quite a harvest from one bag, isn't it? I just can't seem to resist searching through the bargain bins in the floral departments. 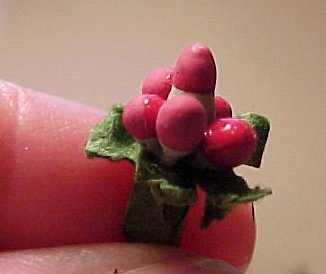 Not long ago I found some branches that were half off and whose berries looked so much like vegetables that I had to buy them. 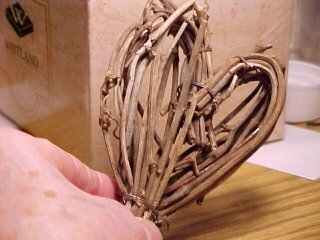 This is one of three different stems I bought. It reminded me of red onions. 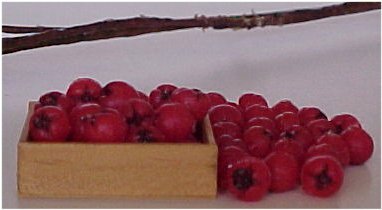 Here are the berries from the white branch. 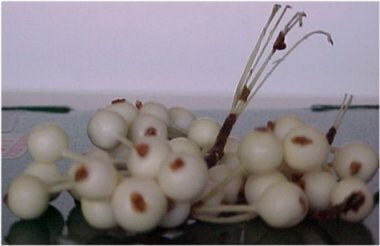 Don't they look just like white onions? 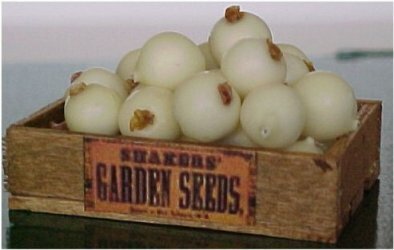 They were mostly three to a stem; twisting some of those stems together makes old-fashioned hanging onions, too. I can remember my grandmother braiding or tying onions to hang when they had gotten quite large at the end of the growing season. Here they are, cut from the stems, just piled in the crate. No painting, no further tweaking. Great, eh? You can see them as hanging onions in Armah Dilla's Texas Tourist Trap. And here are the red berries: perfect tomatoes! 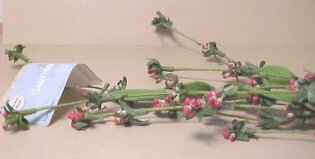 I do plan to touch up the stems with green paint. 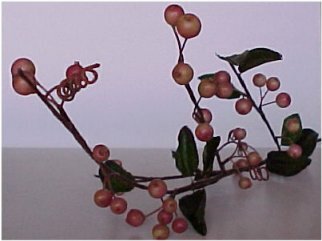 Besides the berries/vegetables, what else can you get from this one branch? 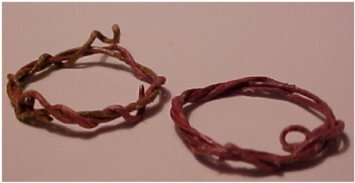 The three tendrils from each stem made one grapevine wreath. Now if that's not a Cheap Thrill, I don't know what is!